HÀ NỘI — Hà Nội faces a shortage of high school teachers that can teach in English, requiring universities to train more students adept at the language to meet demand. There is a limited number of high school teachers in Hà Nội capable of teaching their subjects in English, according to the city’s Department of Education. The demand for English-speaking teachers for different subjects is particularly high at international schools and private schools where foreign students attend. 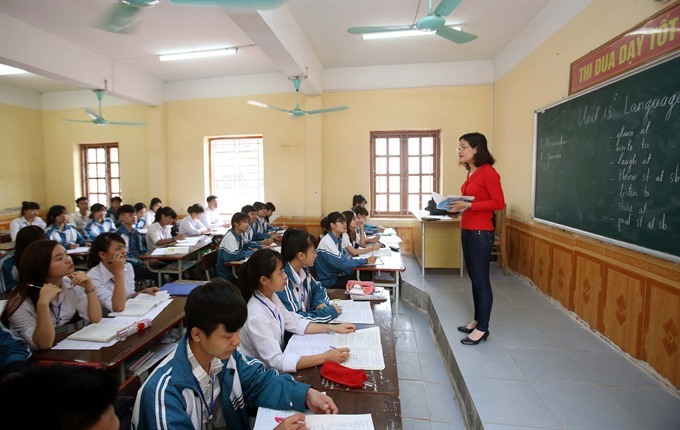 “We have to hire all native English-speaking teachers because Vietnamese teachers who can teach in English are so rare,” said Phạm Thị Minh An, principal of the Olympia High School, part of the Olympia inter-level bilingual schools in Hà Nội. The Hà Nội Academy International Bilingual School has the same issue, according to Nguyễn Thế Đại, chairman of the school’s board of education. “Việt Nam lacks teachers with international degrees in teaching, and teaching is not a field that students who are able to study abroad often choose,” he said. The shortage is not new. Over the last three years, some 400 technical English classes have been provided for lecturers of scientific subjects at the University of Foreign Languages and International Studies, of both basic English and technical English lessons. However, the majority of lecturers don’t feel confident enough to teach in English by the end of the programme, according to reports from the department. The same results were shown for a pilot project of teaching scientific subjects in English at a number of high schools in Hà Nội, which has been implemented for two years. Despite having received 7-9 months of English training, teachers at these high schools couldn’t get familiar with technical terms and weren’t able to plan lessons in English, according to reports. This is a call for teaching faculties to heighten their focus on teaching in English so that students will be confident teaching in the language when they graduate, said Chử Xuân Dũng, deputy director of the city’s education department. “It will help meet the rising demand of high schools and reduce costs [of hiring native English teachers] for the schools and parents,” Dũng said at a conference in Hà Nội last week. Having foreseen the demand, in the 2013-14 school year, the Hà Nội National University of Education (HNUE) started a new programme, which uses English to teach their maths students. The programme’s first batch of students graduated last year after receiving positive feedback from the high schools where they interned, according to Professor Nguyễn Văn Minh, principal of the university. Three graduates of the programme have been recruited by the Olympia High School for the 2016-17 school year after a two-month internship. Olympia High School’s principal Phạm Thị Minh An said it’s an honour to welcome the new teachers, but said the internship should be for six months instead of two so that they have more time to get familiar with the school’s environment. Education chairman Nguyễn Thế Đại of the Hà Nội Academy agrees that internships should be longer and start earlier. “Teaching students should be proactive in contacting schools that they aim to work at, and ask for apprenticeships from their first year at university instead of waiting to be assigned one by their lecturers,” he said. It was not easy to create an environment where students could “live with” English and get used to using technical terms, said HNUE’s principal Minh. They also don’t have many choices for internships since most high schools in the capital city don’t teach in English, he said. Dr Nguyễn Văn Trào, HNUE’s vice principal, said that the school will continue to train teachers of physics, chemistry, biology, natural sciences and information technology to teach in English in the coming years, aiming to “quench the thirst” of international schools of English-speaking teachers. The city’s education department will continue to integrate English teaching into the high school curriculum at more schools in the future, said deputy director Dũng. Specifically, students at Chu Văn An National High School in the city will get to take part in a British A-level programme in the next school year, for which the department has recruited physics, chemistry and biology teachers, he added.